For those of you wanting to extend the upcoming Bank Holiday into Tuesday, then fear not you are in luck. 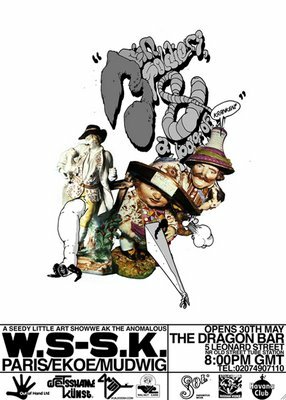 Just when you had gotten used to the idea that the Tuesday season of exhibitions had ended, the Dragon Bar come right back at ya with a bang and hit us up with none other than the long overdue return to London of Bristols finest PARIS / EKOE / MUDWIG to the "THIS WAY UP" gallery. May 30th get it into those diaries cause ya dont want to miss it! at The Dragon Bar, Leonard Street, Close to Old Street.